A tradition on my sons’ birthdays is for us to make a cake in an unusual shape, related to the theme of the party. The only rule we set for ourselves is that everything on the cake has to be edible. We’ve made many cakes over the years, in typical kid-oriented themes: firetruck, pirate ship, Lego, and so on. This year was no different. 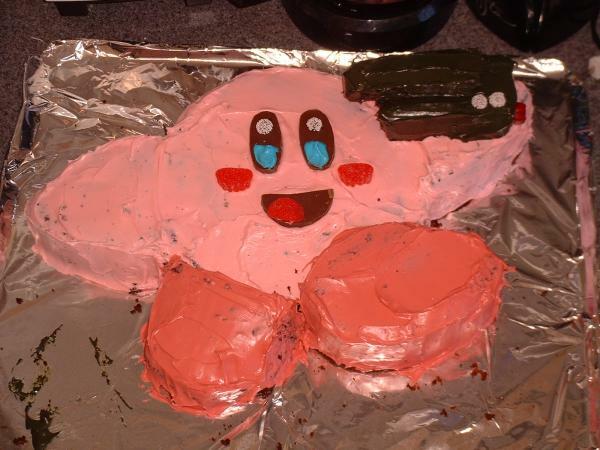 Today’s party was dual-themed: Kirby and movie-making. The cake was in the shape of Kirby holding a video camera (although none of the kids could tell it was a video camera, d’oh!) The kids loved the cake, which was the goal. my cousin thinks this cakes beutifull how did you make it?